A selection of Fruit Shrewsbury, Viennese, Crumbly Oaties, Chocolate Chip Cookies, Stem Ginger and Lemon Biscuits and Double Chocolate Chip Cookies. Ingredients: Fortified WHEAT flour, vegetable oils, sugar, OATS, plain chocolate chips and chunks (sugar, cocoa mass, cocoa butter, SOYA lecithin, natural vanilla flavouring), stem ginger (ginger, sugar), partially inverted refiners syrup, water, raising agents: sodium bicarbonate, ammonium bicarbonate, disodium diphosphate, currants, cocoa powder, natural chocolate flavour & other natural flavours, MILK powder, EGGS, ground ginger, butterscotch crumb ( soft dark brown sugar, glucose (WHEAT), butter (MILK), non-hydrogenated palm oil, natural flavour ), salt. Plain Chocolate contains 39% cocoa solids. Made in a bakery that handles nuts and sesame. 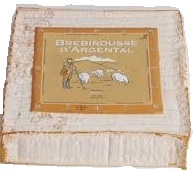 Ingredients: Fortified WHEAT flour, sugar, sultanas 11% (sultana, sunflower oil), salted butter 9% (MILK), vegetabl oils, EGGS, sweetened condensed milk (MILK, sugar), raising agents: disodium diphosphate, sodium bicarbonate. Not suitable for nut allergy sufferers. May contain traces of egg, mustard, oat, sesame & soya. Cherry cookies with a coconut twist. Great well flavoured cookies that taste just like a bakewell tart! Ingredients: Fortified WHEAT flour, vegetable oils, sugar, glace cherries 6% (cherries, glucose fructose syrup, sugar, colour: erythrosine, preservatives:potassium sorbate, SULPHUR dioxide, citric acid), MILK powder, flavouring, salt. Double Milk Chocolate Chunk Biscuits. Chocolate cookies with chocolate chips. Ingredients: Fortified WHEAT flour, sugar, vegetable oils, milk chocolate chunks 18% (sugar, whole MILK powder, cocoa butter, cocoa mass, SOYA lecithin, natural vanilla flavouring), rolled OATS, natural chocolate flavouring and natural flavours, cocoa powder, partially inverted refiners syrup, raising agents: sodium bicarbonate, ammonium bicarbonate. Milk chocolate chunks contain cocoa solids 29% minimum, milk solids 22% minimum. Oat biscuits with a good flavouring of golden syrup. Ingredients: Sugar, fortified WHEAT flour, rolled OATS, vegetable oils, golden syrup (partially inverted refiners syrup 11%), water, raising agent: sodium bicarbonate. Oat based cookies with raspberry. My personal favourite in the range. Delicious ginger biscuits with stem ginger pieces. Ingredients: Fortified WHEAT flour, sugar, partially inverted refiners syrup, vegetable oils, stem ginger 9% (ginger, sugar), EGGS, raising agent: sodium bicarbonate, ground ginger, salt, nutmeg. Hard amaretti biscuits for use in various Italian desserts. 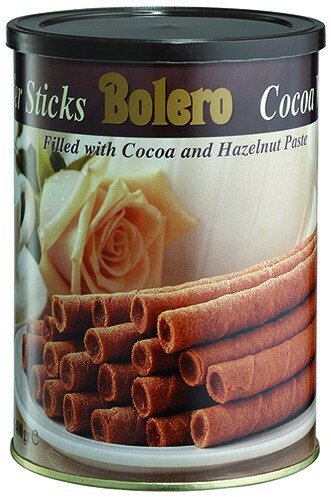 A 400g tin of cocoa and hazelnut paste filled wafer rolls.